This charming piece has beautiful carvings with pheasant and pines. The hunting musicians are animated, as are the deer and the dancers. The hands are hand carved out of wood. The bird moves along with the mechanically produced music and cuckoo call. The sound of the bird is produced by real wooden whistles and the music box movement is hand made in Switzerland. The musicians move as the music plays, and the deer are startled by their sound! 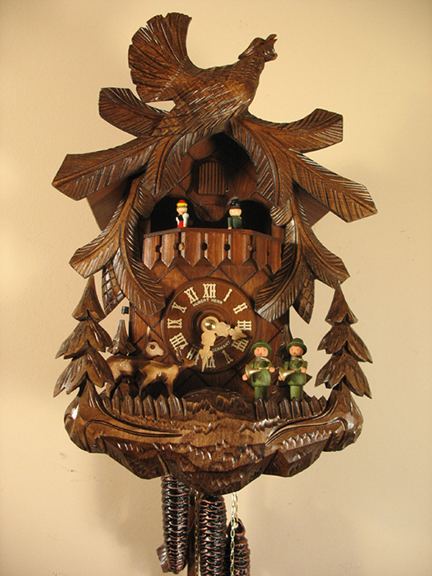 Most musical and animated cuckoo clocks are in a chalet scene. The dancers and musicians usually move around clocks which are shaped as little Black Forest Cottage. This clock is especially unique because the frolicking deer, animated musicians, and twirling dancers are out in the forest under the majestic pines. The clock also features a beautiful carving of an Auerhahn.